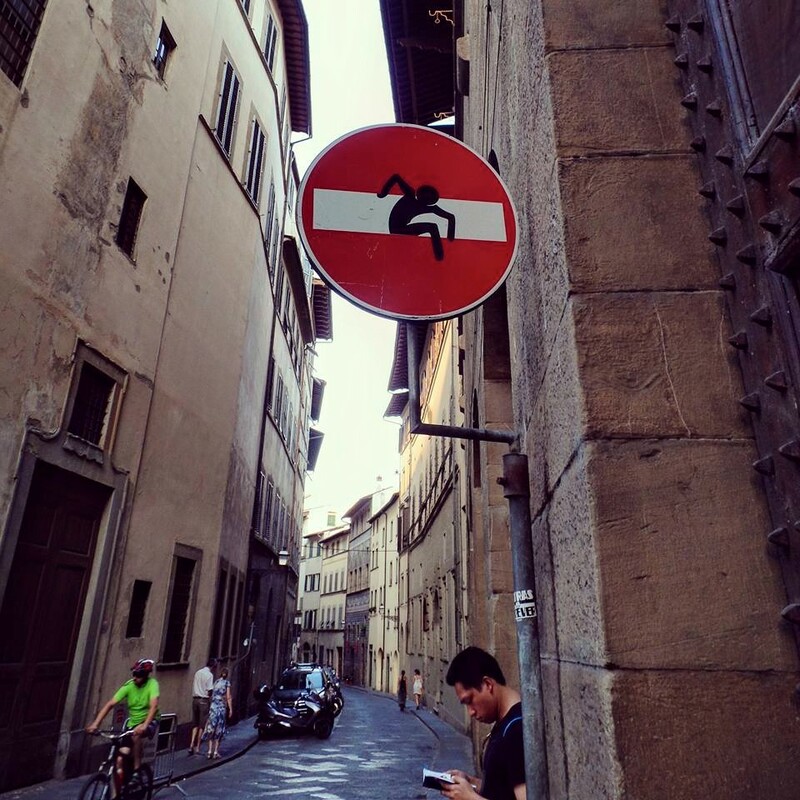 I may have enjoyed Florence even more than Venice — perhaps because I wasn’t expecting too much. 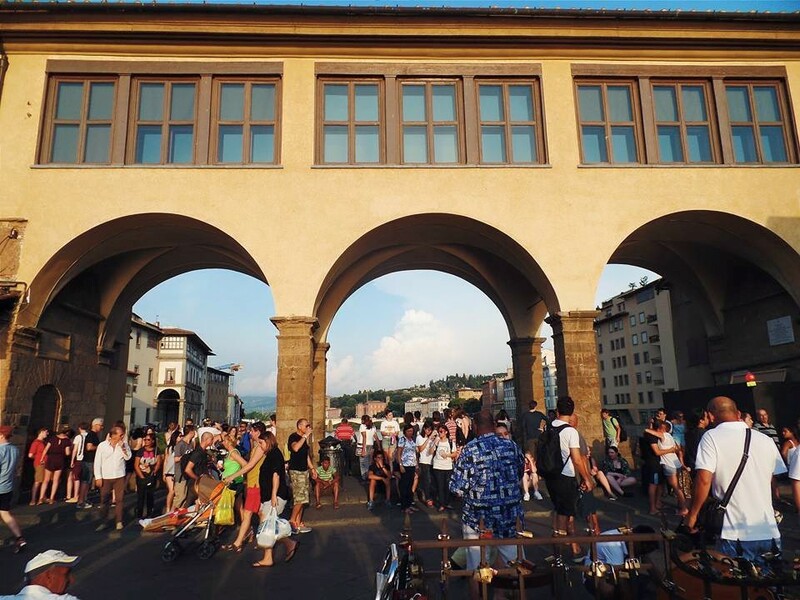 However, as soon as we left the chaotic railway station and entered the birthplace of the Renaissance, I quickly discovered that the easy access to art and quality food made Florence my kind of town. The entire city seems like a museum, with a harmonious architecture style, and impressive statues and clever street art everywhere. 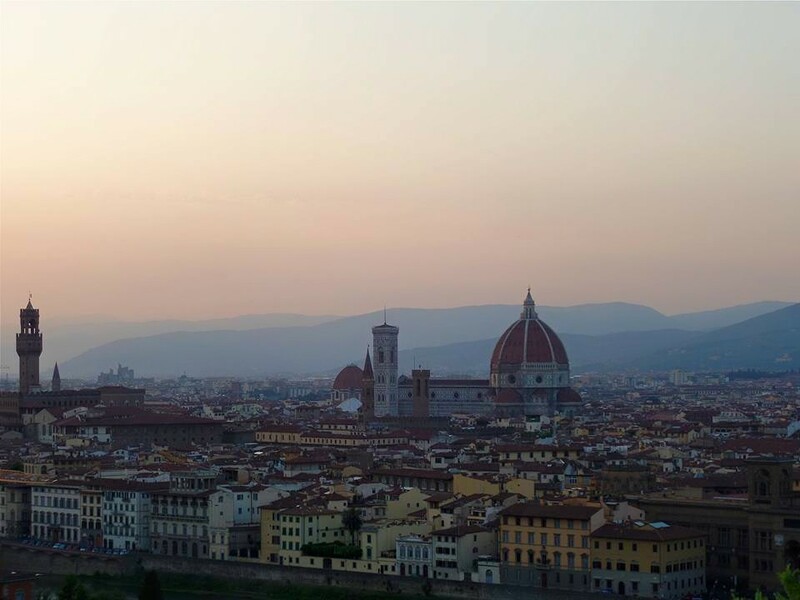 Florence feels small and manageable, yet is bursting with culture. 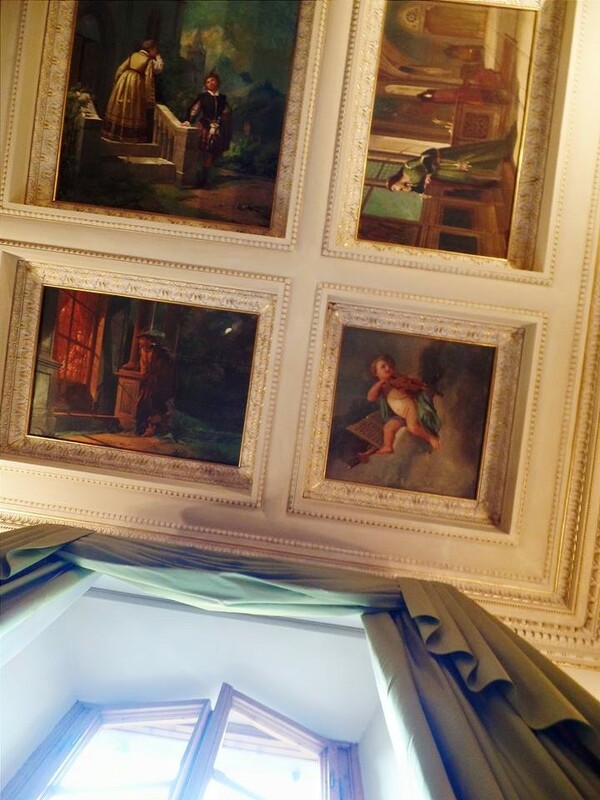 Our hotel, Hotel dei Macchiaioli, is located on the third floor of a former palace called Palazzo Morrocchi and was the most extravagant hotel on our trip. In the 19th century, it was the home base for a group of avant-garde artists known as “I Macchiaioli.” The high ceilings of the lavish breakfast room were covered in beautiful frescoes. It was great staying only a few blocks from all the major sites. 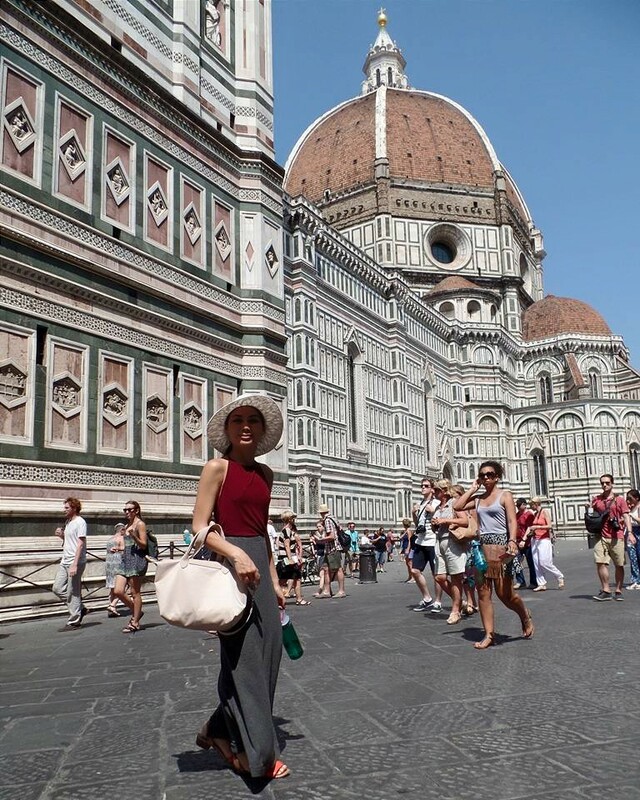 Every day, we walked along the main drag, which was lined with fancy clothing stores and leather shops (Florence is an important city for Italian fashion, after all!). 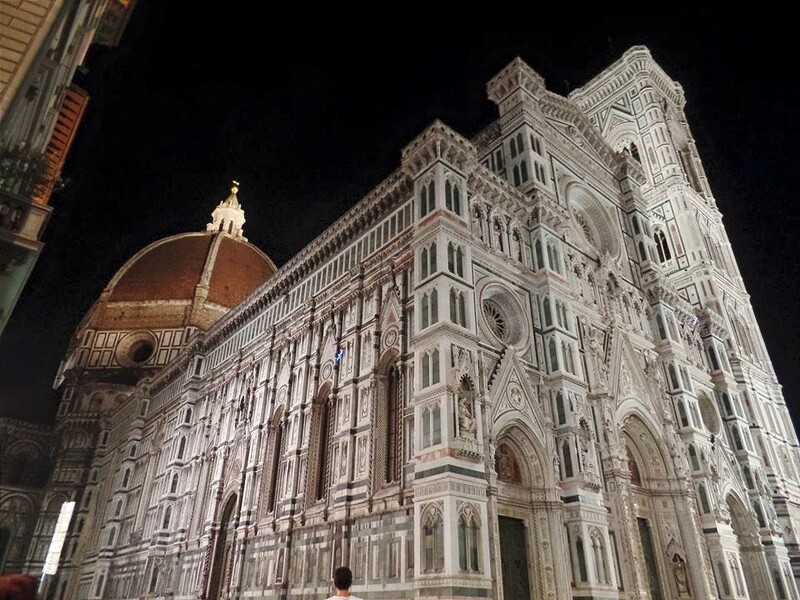 Florence’s Duomo, Cattedrale di Santa Maria del Fiore, has always been my favorite cathedral — and I’ve seen a lot, even just on this trip! 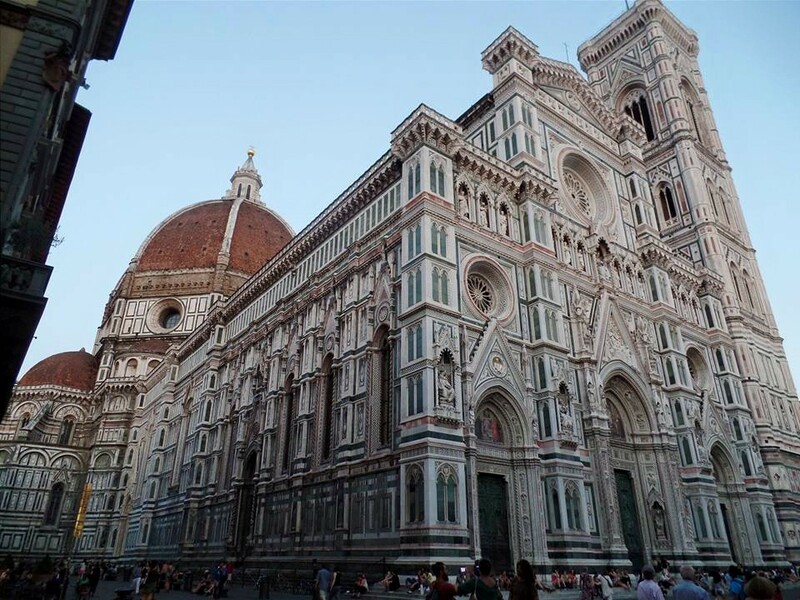 Its perfect dome was designed by Brunelleschi and is still the largest brick-and-mortar dome in the world. Every time I walked past it, I took photos as though it was my first time. 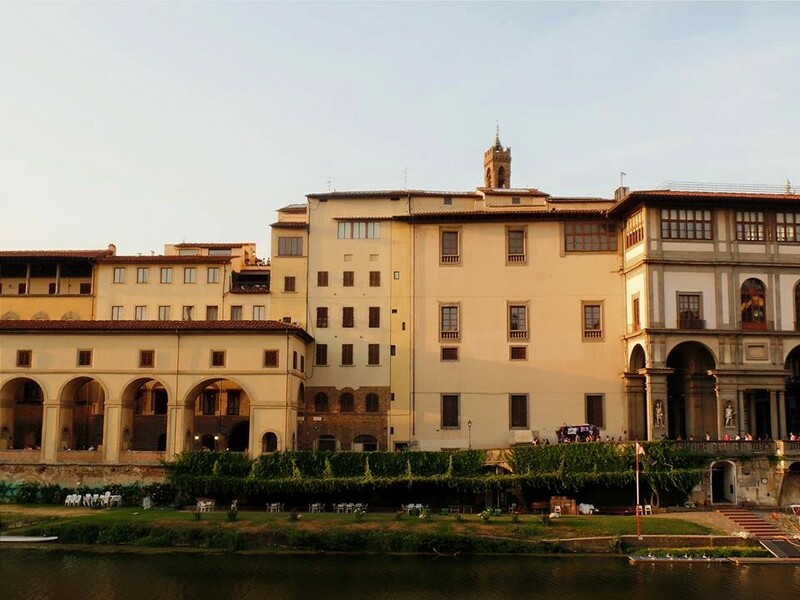 We were in Florence during their free museum day, which was good and bad. We got into the Uffizi Gallery for free but spent about an hour standing in line. Fortunately, it wasn’t too hot outside yet. 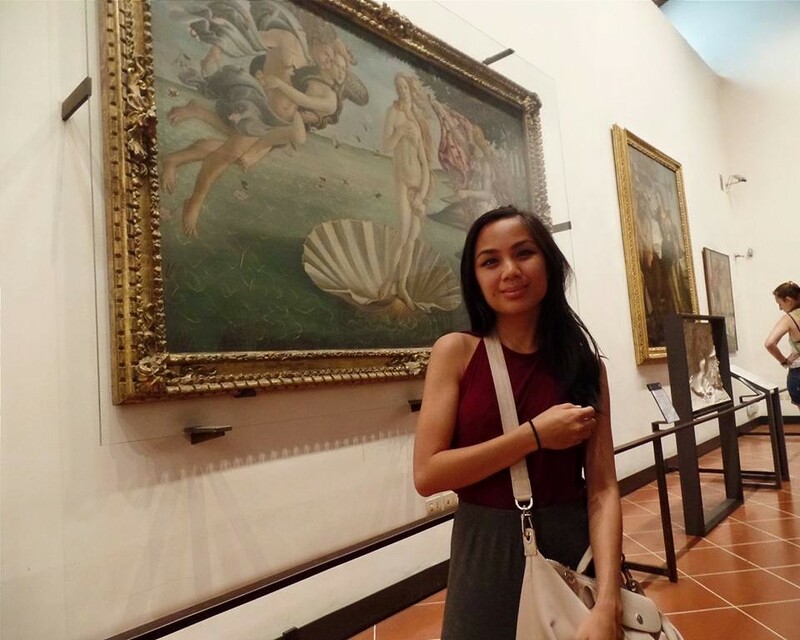 We saw everyone’s favorite Renaissance painting, Botticelli’s Birth of Venus, and enjoyed the museum’s views of the Arno River. Before modern engineering, Florentines had a love-hate relationship with the Arno, which used to flood the city regularly. On one night, we crossed the river into Oltrarno, which seems to be where actual Florentines live. To get to Oltrarno, we walked across Ponte Vecchio (which means “old bridge”), a Medieval bridge along which shops were built. I fell in love with Oltrarno as soon as we arrived. Young Italians cruised by on their Vespas as we climbed old steps on the left side of the road through the hilly neighborhood. We got to our destination, the Piazzale Michelangelo. The view here is unbelievable. We got there right before dusk, so we watched as the red roofs basked under the golden hues of the sunset, surrounded by purple mountains in the distance. Perhaps it should come as no surprise that Florence was one of my favorite cities, as some of our best meals were here. Everything was relatively cheap, especially after glitzy Milan and inefficient Venice. Our most expensive meal in Florence, costing €38, would have easily been about $100 in New York. You must try the bistecca in Florence. Or any beef dish, really. Their roast beef is nothing like those dry, sad-looking slices you get at wedding buffets. 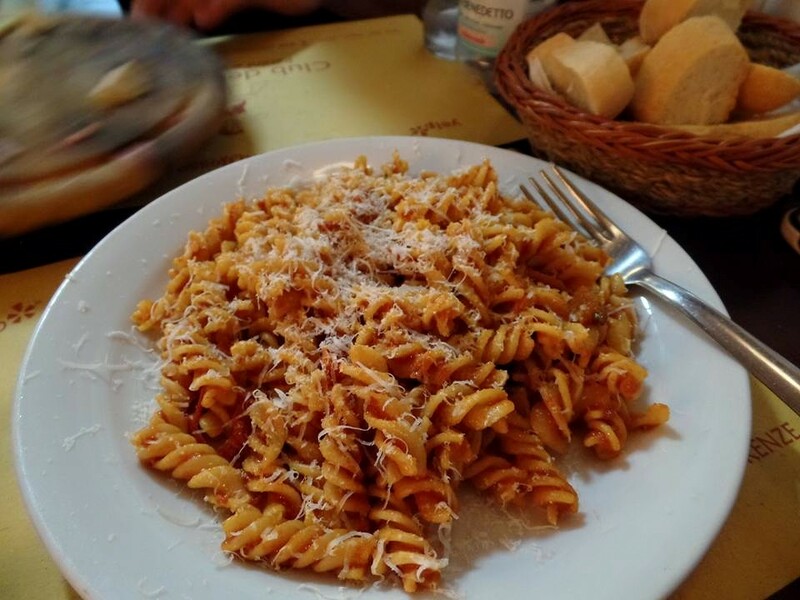 Florence isn’t even known for its pasta, but the pomodoro & basilica fusilli I had almost brought me to tears (I know that sounds dramatic, but it’s true; ask Anthony). We were at another one of Rick Steves’ recommended restaurants for lunch, and I knew the pasta would be good because the tiny kitchen had some serious cookware — huge, old stainless steel pots, tattered by years of love. Just like with pizza, you can tell a pasta is good if the most basic sauce (tomato and basil) is mindblowing. The fusilli was perfectly al dente; the sauce just coated the noodles (unlike at most American restaurants, which drown the pasta in sauce); and the pomodoro sauce was so complex that there’s no way I’d be able to replicate it with the canned tomatoes I use in the U.S.
Florence seemed like the quintessential Italian city, filled with old art, good food, and simple living. I could eat here forever, but it was time to move on. Ciao, Pisa! Look up the specialties of each city. I don’t typically order much beef at restaurants, since I’m more of a pig and fish girl. 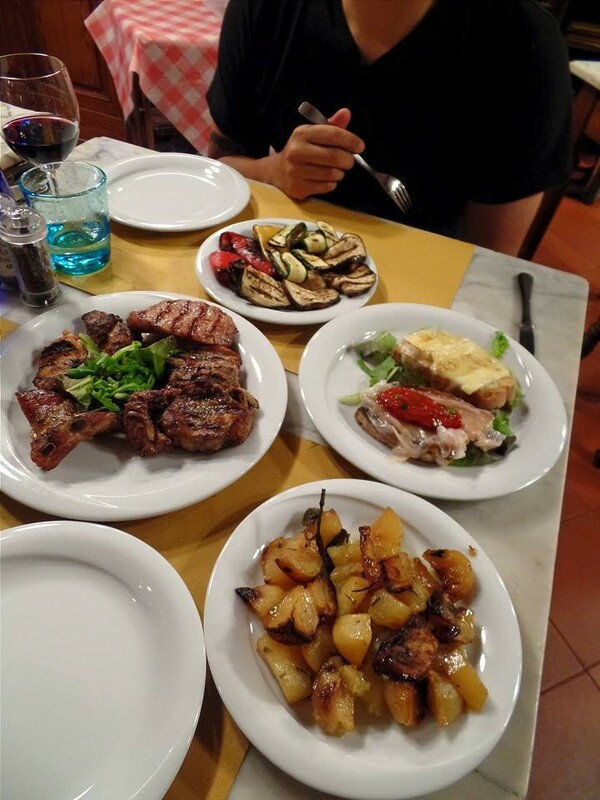 However, since bistecca is a Florentine specialty, we made sure to order beef at every dinner we had in Florence. The moral of the story is to never judge an item of food based on your experience with it in the U.S., as America does not respect food. Don’t make plans to enter the Duomo unless you have all day. 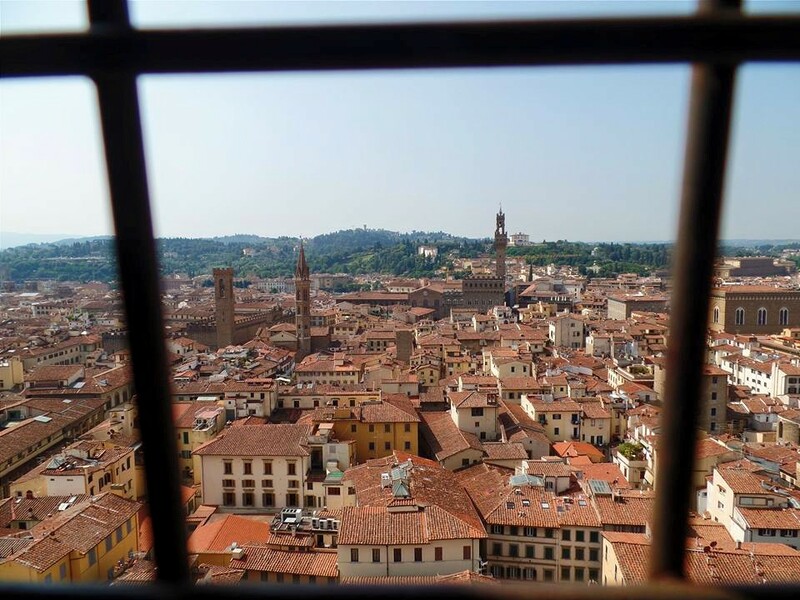 Our only unpleasant experience in Florence was on our last morning. I had tickets for us to climb up the campanile for stunning views of the city and the dome. Thinking two hours would be plenty of time, we stood in line at 9 am. There was already a line wrapped halfway around the cathedral. Everyone was confused, as there were no signs to guide us. We didn’t know which line was for ticket holders or non-ticket holders, for inside the cathedral or for the dome and campanile. When we finally got through, we had almost no time left before our train to Pisa, so we had to forgo the campanile and race down the stairs of the dome. 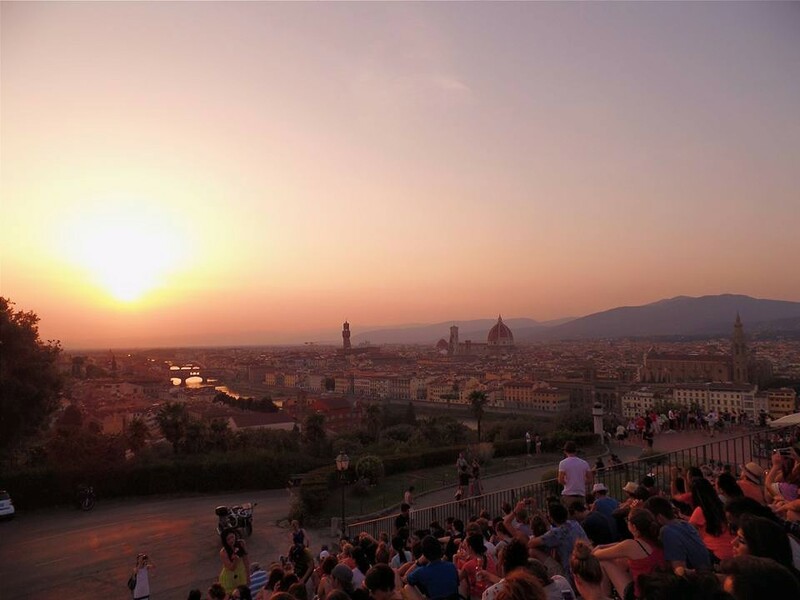 It was frustrating after such a perfect time in Florence. My restaurant recommendations: Antica Mescita San Niccolò in Oltrarno, Il Club del Gusto, and Trattoria Anita. 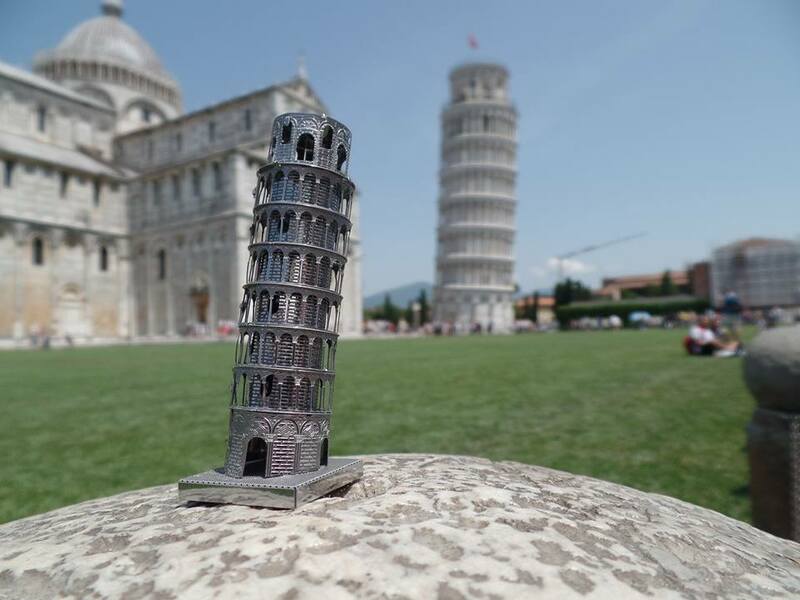 Anthony had built a Metal Earth model of the Leaning Tower of Pisa, so we couldn’t visit Florence without taking a little detour on our way to Rome. Many tourists mistakenly make a beeline for the Leaning Tower, but Rick Steves (oh, Rick Steves, where would we be without you?) encouraged us to explore the charming town. We followed his walking tour through Pisa, which was once a powerful maritime nation. The tour led us to a lovely gelateria, and then past the University of Pisa, one of the oldest universities in the world. As we got closer to the Leaning Tower, everything got more and more touristy. Outdoor restaurants lined the streets, and tourists clogged every inch of space. We finally arrived at the Leaning Tower, which is actually a campanile of the nearby cathedral. The tower’s infamous tilt began during construction, caused by the shallow foundation that could not support the heavy structure. As decades passed, the tilt increased before the tower was completed. Restoration work has been done in the past few decades to decrease the angle of the tilt to 3.99 degrees. Even more impressive than the Leaning Tower was the tourists. 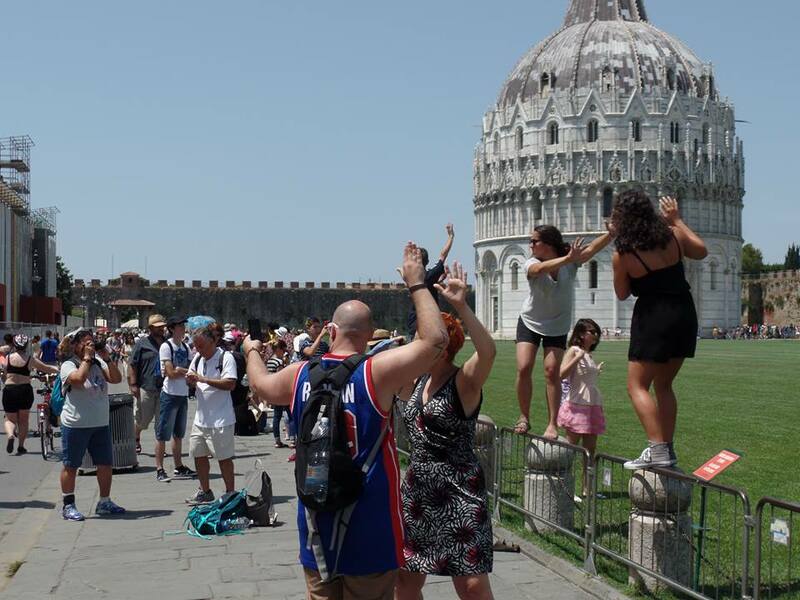 Everyone was in such awkward positions, trying to get such similar shots — either pushing or holding up the Leaning Tower. Anthony and I had to be the only two who deviated — he photographed his Metal Earth, and I kicked the Leaning Tower (while giving birth to an ambulance!). How’s that for a shot?